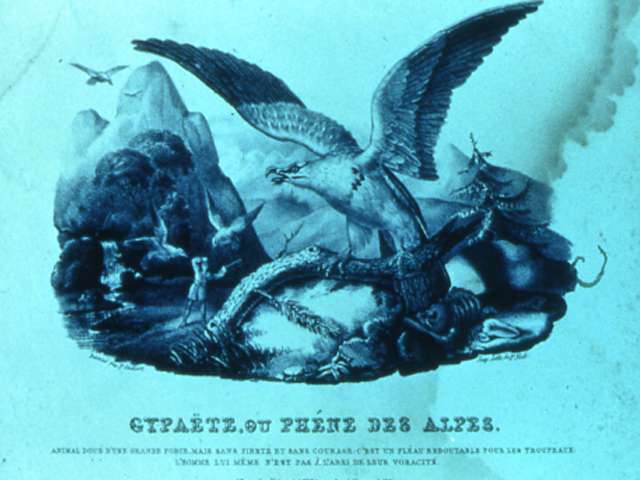 This raptor lives in the Alps, Pyrennes and Corsica mountains. 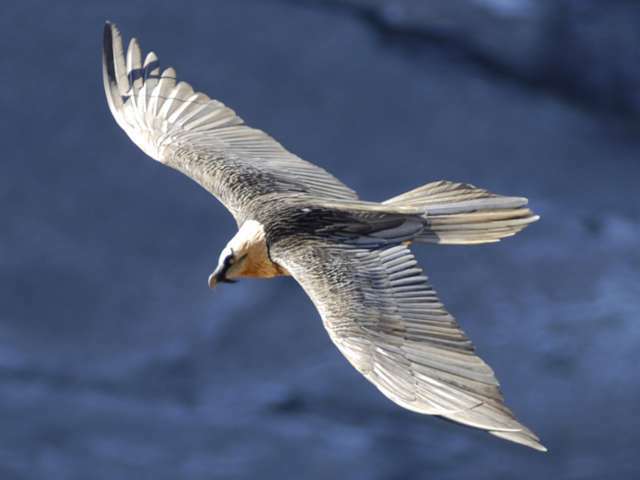 Aka "the bones breaker", The bearded vulture is the only animal that feeds almost exclusively on bone. The Vanoise national park and the Stelvio one are 2 of the main watching areas of reintroduced individuals. 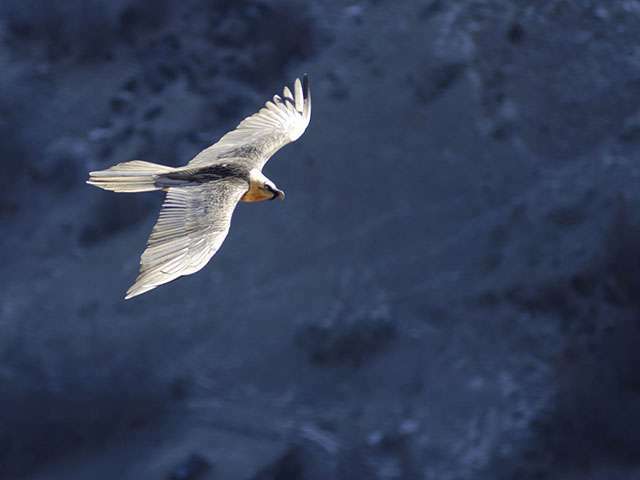 For several years, we have the advantage to watch a couple of bearded vultures that lives in the surroundings of Peisey-Nancroix. The development of the wild ungulate population (ibex and chamois) are favourable factors for this necrophagous bird. Young birds were born for the hapiness of naturalists and the valley inhabitants who contribute to safeguarding rare endangered species. The historical male of the breeding couple is Phénix Alp Action (W01), it's the first bearded vulture born in the nature following the reintroduction program. It was born in Haute Savoie in 1997 and has been geneticaly identified thanks to a feather found in the Peisey-Nancroix valley by the Vanoise national park rangers. The historical female is G027, also geneticaly identified thanks to a feather. The observations tend to prove that the birds of the couple have already changed several times since 2003. Even though the Peisey-Nancroix valley has been overflown by birds for many years, it's only in 2003 that bearded vultures settled down and built an eyrie. 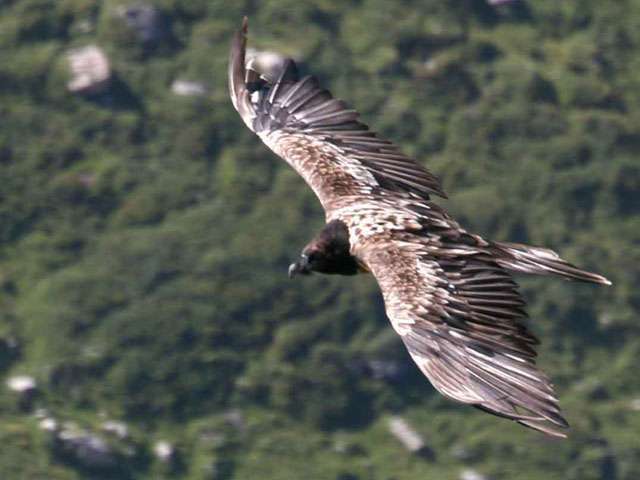 - However, after this failure, the birds build another eyrie that will be used in 2005 and the bearded vulture couple gave birth to another chick at the end of march. This young bird is called Peisyllon (W31) by the pupils of the Peisey-Nancroix school. It left the nest in early august and has been often seen around the breeding site during a couple of month. - In 2006, a chick (W40) was born between the 31st of march and the 4th of april but then died a few days later. - Plumo (W41), the chick borned in 2007 on the site left the nest on the 18th of july. It was often observed in the Ponthurin valley until october. - In 2008, the incubation started on the14th of january failed. - In 2009, the brooding started on the 14th of january and a chick was born the 11th of march. The young Peiserot (W62) took flight the 29th of june. - In 2010, the incubation started the on 9th january and ended with the birth of Primevert (W74) on the 5th of march.It tooked wings on the 4th of july à 8h22am. It was filmed by the wildlife filmmaker Mathieu Lelay for his documentary "des Gypaètes et des Hommes". - In 2011, the brooding started on the 10th of January ended on the 9th of march with the birth of a new chick, Pépite (W87). Pépite took wings on the 10th of july at 8h17am. - In 2012, the the brooding started on the 27th of january and a chick, Praline (W114) was born on the 21st of march. Praline left the nest on the 14th of july in the early afternoon. In 2013, the the brooding started on the 20th of january and a chick, Passieu (W123) was born on the 17th of march. Passieu left the nest on the 19th of july some minutes before 8h15am. - In 2014, the laying is confirmed on the 24th of january but the breeding aborted while the adults abandoned the eyrie on the12 of april. This is not due to natural issues but because of humans disturbances on the major sensibility area. - In 2015, the couple settled down on the side of "le petit Mont Blanc de Peisey". The laying took place in the first 10 days of january. Birth of Pilou on 3rd march and first flight 24th june. - 2016, The couple comes back on the ancient breedind area of "les Sétives", incubation begins on the 22nd of january, birth of the chick on the 16th of march. Pirou leaves the nest on the 8th of july at 9h33am. - In 2017, the couple stelled down again in the "Mindières" area to start breeding on the 18th of january.The egg hatching was confirmed between the 5th and the 10th of march.